The incredibly talented girls at the OCC have posted a fun mid-week challenge to use the Vintage Values technique on a Verve project. You use 2-3 shades of the same color ink and a craft sponge. The idea is to keep the darker shades towards the edges and the effect creates a glow on the lighter, middle area of your sponged cardstock. Very cool! 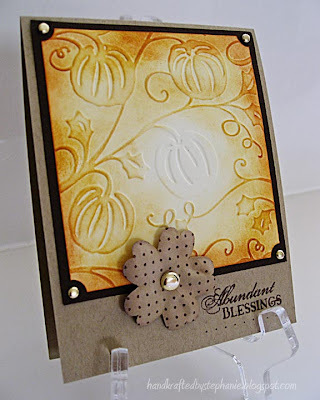 I chose to go with peachy/orange tones and highlight the embossed pumpkins. All of their cards turned out really gorgeous! I had never tried this technique before, but I think it would be very fun to try in different colors. My card is very simple, but sometimes simple is fine by me! Cardstock: PTI, Bazzill; Stamps: Verve; Ink: Memento Rich Cocoa, CTMH; Cuttlebug embossing folder; SU! ticket punch. Other: Flower, gold brads, craft sponge, paper piercer.